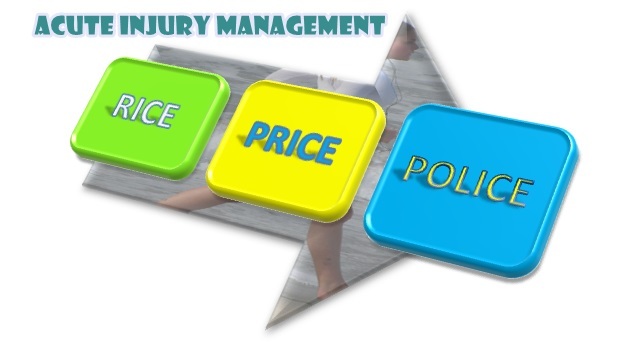 For a long time the go-to initial treatment for acute injury has been RICE (That’s Rest, Ice, Compression and Elevation), but that is all changing for the better and it is time to look after your injuries better with POLICE. Looking after your injury in the first 72 hours is so important and can mean a much faster recovery. But with so many changes and different advice out there, it is hard to know what to do! Some say heat, some complete rest, some ice, and others not… So what is it? In the past, we wrote a popular post on RICE – which for a long time has been the go-to advice for acute injuries. Now there hasn’t been huge changes to this, but the changes are important and when we want out injuries to heal as strong and fast as possible, why not look after it the best you can right? The new, best-practice recommendations for acute injuries such as muscle strains, ligament sprains etc, is to follow POLICE. As mentioned, protection of injured tissues therefore is an important principle. But, full rest may be harmful as it causes wastage and dysfunction of the tissue and inhibits recovery. The secret is to find the ‘optimal loading’. Optimal loading has replaced rest with a balanced and progressive rehab programme. This early and controlled loading encourages early and strong recovery. So that is it, Protection, Optimal Loading, Ice, Compression and Elevation. The last three have not changed and are there for well known, but it is very exciting to see some changes happening in the recommendations for acute injuries that do encourage strong healing and not complete rest and cotton-wooling injuries. To know what “Optimal Loading” is for your injury, see your physio for guidance on this to get you on track to a full recovery.